enviroCare’s chlorine- and phosphate-free formula gets fruits and vegetables clean without harming them or those who’ll eat them. 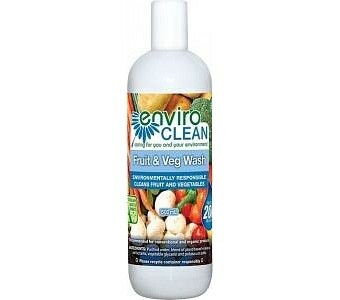 Just a few drops of this ultra-concentrated cleanser in a sink of water will thoroughly and easily rinse away dirt, manure, chemical fertilisers, waxes, herbicides and pesticides. It’s complete cleaning for organic and conventional produce alike, and it even helps fruit & veg stay fresh – just pat dry and store as you normally would, preferably inside a brown paper bag.